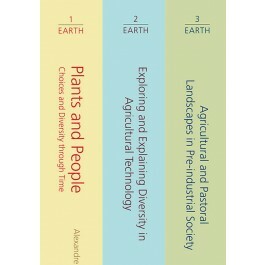 All three volumes in the EARTH series; Plants and People: Choice and Diversity Through Time, Exploring and Explaining Diversity in Agricultural Technology, and Agricultural and Pastoral Landscapes in Pre-Industrial Society: Choices, Stability and Change Agriculture has been at the heart of human action and decision-making from the beginning of the Neolithic right up to the present day, when it presents some of the deepest hopes, and greatest challenges for our future. The daily activities and concerns of people, as they went about producing the food to sustain themselves, determined the nature of their relationships, the structure of their communities, and the overall organisation of the societies in which they lived. Knowledge of crops, soils and local climates was complemented by skills in cultivation, the making of agricultural tools and shelter for humans and livestock. This all took place against the background of a changing natural, anthropogenic and social landscape. This series of three Monographs delves into the dynamics of non-industrial, non-mechanised agriculture, from different vantage points– human interaction with plants (including the skills involved), tool use and agricultural techniques, and human adaptation to and interaction with landscapes. Various disciplines are called upon to explore and highlight ways in which pre-industrial societies participated – and often still participate – in developing and maintaining crop diversity around the world, using techniques, landscape modification and plant selection for food and a host of other uses. This book series takes a resolutely human-centric approach, investigating the knowledge, skills, perceptions and experiences of farmers, both of the past and of the present. Scientific methods are applied for example in the analysis of botanical remains, function of tools, structure of soils, and fluctuations in climate, in order to gain a deeper understanding of the knowledge, relationships and experiences of individuals, groups and societies in relation to their agricultural activities, from the beginnings of agriculture some 8,000 years ago to the present day, emphasising a diachronic and methodological perspective. All the books are richly illustrated and in colour, and aim at readers interested in agricultural heritage, history, archaeology and anthropology. The book series will appeal to specialists as well as non-specialist academics, students from various disciplines, and the informed general public.